This guide was developed by the authors to support the planning, growth, and development of ecotourism facilities that offer beds, activities, and food to guests. Powell, Larkin, Powell, Kelly, Nieland, Katie., 2018. 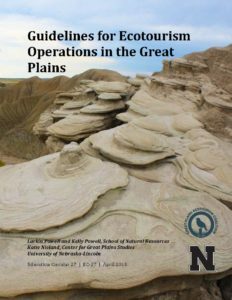 Guidelines for Ecotourism Operations in the Great Plains (EC-27): 8 pp., size 8.5″ x 11″ Available on-line or as a pdf only.